NOTE: Air-Con check valves are made by removing the MPV or Intake valve’s main spring. The poppet spring and stroke is set to customer requirements. Please refer to corresponding MPV or Intake for dimensions. The Check Valve will prevent back flow of gasses in the system. 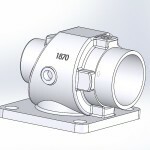 The valve is installed in any piping run allowing flow in one direction only. Air-Con check valves are made by removing the MPV or Intake valve’s main spring. The poppet spring and stroke is set to customer requirements. Please refer to corresponding MPV or Intake for dimensions. The double disk valve is a low pressure loss valve with a flexible hinge between the disks. The double disk valve comes in pipe sizes and a variety of materials.